APSCUF live-tweeted February’s State System budget-appropriations hearings before the Senate and House of Representatives. Watch both sessions in their entirety on our YouTube channel. Together, the hearings last more than four hours, so we’ve compiled the segments we thought were of most interest to APSCUF members. Here’s what stood out to us in the Senate hearing, in photo. Some background: Pennsylvania’s State System of Higher Education’s Board of Governors requested a 2018–19 appropriation of $526.2 million, an increase of $73.1 million over current funding. In his address in February, Gov. Tom Wolf announced $15 million more for our 14 universities in his budget proposal. 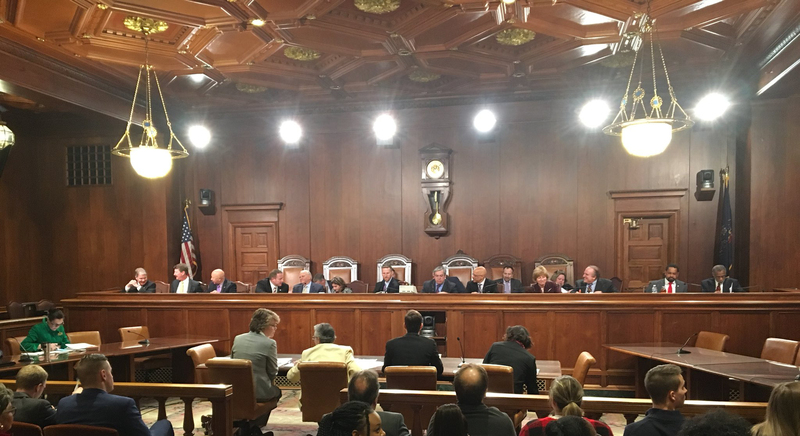 Interim Chancellor Karen Whitney, Shippensburg University President Laurie A. Carter, and Brian Swatt, Board of Governors student member and Indiana University of Pennsylvania student, responded to legislators’ questions. Also in attendance were students from throughout the system who would attend a State System funding rally that afternoon. Sen. Andy Dinniman kicked off the hearing by discussing ways the State System could save a “considerable amounts of money” through bill revisions and consortiums. He is proposing legislation that would give State System universities control of money that is not part of state appropriations, he said. He praised Whitney’s work as interim chancellor. Whitney acknowledged the inverse in funding for state-owned universities, compared with how much Pennsylvania appropriated at the dawn of the system. She proposed the state “at least meet the students 50-50,” a process she said would take years. The system should continue to ask how it can make its dollars go farther, she said. Sen. John Eichelberger immediately blamed APSCUF’s collective bargaining agreement for some of the system’s problems. Eichelberger asked about the State System’s four-year graduation rate. Whitney shared four- and six-year rates (41 percent and 59 percent, respectively), both of which are higher than national averages (28 percent and 49 percent). He followed by asking which of the 14 State System universities had the lowest graduation rate, information that Whitney did not have broken down by campus. He asked for the average base salary of a professor. Eichelberger broke in to repeat that he wanted to know about professors. Chair Sen. Patrick M. Browne intervened, reminding Whitney of the hearing’s limited time and asking her to answer Eichelberger’s question directly. “OK, and what are the work hours that are required by the CBA?” Eichelberger asked. Whitney said she did not know the exact number in the agreement but estimated faculty work a minimum of 45 hours per week with their required classes taught, preparation, advising, research, and service. She pointed out that most faculty work year-round with writing and research in the summer. Whitney confirmed the CBA’s required five hours of office time. Sen. Kim L. Ward asked a question she said she poses every year: whether the State System is or can coordinate and condense higher-cost programs such as nursing or engineering. The State System reviews graduates by degree and program enrollments, Whitney explained. “We have over the years removed way more programs because of changing interest by our students and industry, and we’ve added programs in response to increased interest, and it’s a continuous effort,” Whitney said. Ward asked whether any programs were only offered at some schools. Whitney confirmed there are. Ward raised her concerns about Dinniman’s ideas of affording universities more power at the local level. Whitney pointed to the system’s research on workforce trends and how they have incorporated those findings into program offerings. The system’s top three areas are now STEM-H (science, technology, engineering, math, and health), business, and education, Whitney said. Ward closed by praising the State System’s graduation rates. Sen. Art Haywood asked about employment of State System students’ parents. Whitney said she did not have the information disaggregated. The system does monitor average family incomes in Pennsylvania, Whitney said. Haywood asked how Pennsylvania students came to have such high student-loan levels. The average student debt in Pennsylvania is $35,759 and $34,000 for State System students, Whitney said. Haywood pointed out that funding for the State System is roughly equivalent to what it was in 2001–02. He asked if the State System has a strategy to increase enrollment to full capacity. Haywood asked Whitney about APSCUF’s CBA. Whitney prefaced her response with her perspective as interim chancellor for seven months and Clarion University’s president for seven years. “I will always say I have the highest appreciation in regard for our own employees,” she said. “I will say there is a larger cultural issue here in the state of Pennsylvania — that is beyond this system of 14 universities — around collective bargaining. So I’m going to point out probably what you already know because you see people, system heads like me or agency heads, come and go all the time. There are larger issues here that the workforce needs — that’s needed in teaching and learning at these universities, and the probably the 60- or 70-year-old construct of collective bargaining — are out of whack. And that’s the challenge, so we’re working on it. We’re trying to make the best use of the mousetrap we’re working in right now, but I just want to point out the overall challenges of work rules and compensation and how it’s slowing us down and getting in our way of being the kind of operations that I think we all would like to see, the employees as well. Sen. Scott Martin continued the union discussion. Martin discussed looking into early-retirement planning and asked about performance funding, touching on costs as well. He circled back, asking about standards for performance funding. He also asked about advising and career guidance. More than 40 percent of State System students are first-generation college students, Whitney said. “And that’s a proud tradition of our state universities and how they’re working in terms of the fastest way for upward mobility through higher learning,” she said. She described dual enrollment and programs targeting middle and high school students for financial and academic planning. She discussed the growth of STEM-H and business programs. Martin talked about the state’s diverse regional workforce needs. “To be able to adjust your programs and personnel to match what the needs of the current environment are, I think, is critical, and also in terms of maintaining costs,” he said. He also lauded training programs. Whitney offered to provide information about the system’s diverse program array. Sen. Lisa Baker continued the workforce-development conversation. Whitney referenced the system’s database of workforce information that looks at needs years ahead. “If a university came to you and said, ‘I’d like to introduce this program by next fall,’ do they have the flexibility to get that done?” Baker asked. Whitney affirmed it was possible after changes made at January’s Board of Governors meeting. Baker asked Swatt how he valued internship opportunities. He lauded the “experiential learning component” and said all students ought to have internship experiences. Baker’s final question dealt with campus safety. Sen. Sharif Street asked what the State System is doing to ensure its curriculum is aligned with future economic needs of Pennsylvania’s economy. Whitney referred again to the State System’s labor-force data and said the State System continually works with industry leaders. Street asked Swatt for his recommendations to improve the State System. Swatt reiterated the importance of internships combined with classroom experiences. Sen. Mario M. Scavello, on the council trustees at East Stroudsburg University, referenced the university’s newly enacted Warrior Promise, suggesting it as an option for the rest of the system. Whitney described alternate tuition programs at other State System universities. Scavello changed the topic to Cheyney University. Cheyney’s enrollment-building efforts and ideas do include student recruiters, Whitney said. “And the advantage for your students would be the more you bring, the less the tuition you can, you know, it’ll help you with your tuition,” Scavello continued. Sen. David Argall commented on the number of open parking spaces he saw when visiting Kutztown University the previous week. “Now perhaps Kutztown has done an amazing job of planning for the future, so they have too much parking, or maybe it’s because of declining enrollment and that’s my fear,” Argall said. He then brought up the RAND study, which he called “unbiased” and “independent.” He said those results should be available in the next few months. Whitney said the universities historically had a pipeline of high school students and did not change fast enough when the flow ebbed. The State System is addressing the issue now, she said, by enrolling transfer students, for example. “You may have missed the cars because they were transiting,” she offered, adding that part-time and online students or students working in the community also might account for empty parking spaces. The State System also wants to serve the 1.4 million people in Pennsylvania who attended some college but do not have a degree, Whitney said. Whitney then brought up unions. Sen. Bob Mensch began by addressing costs at State System universities. “Education is becoming increasingly expensive, and there are some reasons why it should be,” he said. “There are some artificial reasons or other contributing factors that are making it expensive as well. Whitney discussed the State System’s preferred relationship with the community colleges, calling them valued partners. She said the system is looking at ways to improve access and break down silos. Whitney referenced her desire to build an “academic marketplace” across universities. Mensch mentioned a friend who had three daughters, each attending a different State System university. There’d be more meetings, more silos, and possibly more competition versus collaboration, Whitney replied. Whitney talked about STEM-H graduates and said the State System provides great value. Mensch closed by mentioning the lack of public higher-education opportunities about Interstate 80. Sen. Thomas H. Killion, who lives near Cheyney University, said he sees opportunities at the school in its location. He asked about Gov. Tom Wolf’s proposed line item specifically for Cheyney University, on which Whitney said she could not elaborate. Killion also asked what the State System was doing to bring Cheyney back to where it needs to be. She pointed out that Cheyney is not the smallest of bachelor’s-degrees granting schools in Pennsylvania and that several other State System universities fall in the Top 25. Sen. Elder A. Vogel Jr. asked Whitney to discuss collaborations with community colleges. Whitney discussed policies in place and predicted transfer rates would continue to increase. Vogel commented on State System universities’ television ads he’s seen in the Pittsburgh media market. Whitney explained that each university controls its own brand, reputation, and communication but that the State System is looking at consortium pricing for advertising. Universities do look at what marketing approaches will give them the most bang for their buck, Carter said. She shared her experiences with her marketing budget and resources at Shippensburg University. “So it is a complicated puzzle, and each university has to do it differently based upon who their community is and who they’re trying to reach and how they’re trying to reach them,” Carter said. Vogel asked whether each school had the same advertising budget. Whitney reiterated that each university takes its own approach to advertising and said each had its own budget. Whitney suggest looking at marketing analytics, and Vogel asked for that information. He used Clarion University as an example, citing its enrollment decline. “And, quite honestly, if that university would close, it would destroy that town up there,” he said. We are now in “dollar crunch,” he said. He said community colleges have taken some of the State System’s students and asked Whitney whether the system has thought about studying the community colleges and their costs. He also asked about group purchases. Whitney reiterated the State System’s consortium-procurement practices. Sen. Scott Wagner brought with him handouts that he gave to Lois Johnson, associate vice chancellor for administration and finance. He asked Swatt about his studies at IUP. State System employees’ salaries already are public records the senator can obtain at his convenience. Wagner read pension-liability numbers from a State System balance sheet. Wagner talked about a now-retired West Chester University swim coach who brought millions of dollars into the university through camps he ran. At past hearings, Wagner had asked then-Chancellor Frank Brogan about what the coach’s pension would be based on his W-2 earnings, he said. Wagner asked Whitney how many union grievances the system had last year and what they spent in legal fees for those grievances. She said she did not have that data but guessed “a lot” and could gather the information. Sen. Judith L. Schwank, a member of the State System’s Board of Governors, addressed the discussions thus far. “In terms of a budget hearing, you would think that we always talk about numbers, but what you’re hearing more often is policy because policy drives funding, right?” Schwank said. She asked Swatt and Carter what changes they’ve seen as a result of the report. Carter mentioned the expedited timeline for approving new academic programs and task forces that have been meeting to address State System problems. From the student perspective, he said, many students are not completely familiar with the Board of Governors’ activities but he thinks they are realizing the shift in theme. “A lot of more students are caring about the system, about what policies are going on, and, most importantly, their tuition rates and the fees at their universities, and a lot of student leaders are heavily invested in that,” he said. Schwank asked Whitney to talk about a possible tuition increase for State System universities. “And at the same time, I think it’s my job to provide great clarity on the current cost to operate, so that there’s nothing misleading or misunderstood,” Whitney said. “The board rightfully suggested, the system board in October, that to meet our costs of going forward next year, we would need an additional $73 million. There’s two ways we get money: It’s from the state or the student, and the other thing we can do, we’ve talked about, had good talk today, (is) increased efficiency of what we’re doing. We are no longer in a position to cut programs because much of the programs we’re talking about are the very ones that ensure student success. We are eliminating academic programs that aren’t meeting in student interests or industry interest; we talked about that. Committee Chair Sen. Patrick Browne announced a second round of questioning. Dinniman praised West Chester’s bioengineering program. Scavello expanded upon his earlier ideas for student recruitment. Vogel echoed Scavello’s marketing ideas. Whitney said universities are experimenting with alumni recruiters, for example. The State System’s population is now much more diverse, Whitney explained. Wagner began his second round by reminding Whitney of his request for salary and grievance information. He also asked for details about post-retirement benefits and pensions. He compared the State System with private sector and other state benefits. “So our benefit costs are wildly out of control,” he said. He asked whether State System retirees are getting healthcare benefits for the rest of their lives. In general, yes, but the State System has made changes for new employees, Johnson explained. She pointed out about half of employees are in the pension plan, compared with (almost) all for retiree healthcare liability coverage. “So, Brian, the education today is that this is a system that was set up years ago,” Wagner said. “It is doomed for failure. The numbers are gonna sink. Financially, there’s just no path out of this unless you just keep throwing more money in, and, you know, as I travel around the state, people are very upset about the school taxes on their homes, and then I also hear regularly — last year, I heard from a lot of students when the tuition increases went up, and that coincided with union contracts going up. And many of the students here today, and potentially you also, you know, have a lot of student debt. And I don’t know how you’re ever gonna pay this student debt. But it has been your student debt — what you’re gonna pay and what you are gonna be saddled with and your parents — your parents and whoever co-signed — they cannot file bankruptcy. So the system is gonna to track you down — and your parents and whoever — for the rest of your lives. Wagner did not stay for the rest of the hearing. “Nobody’s done a bang-up job with anything, even including the General Assembly over a period of years,” Vulakovich said. “OK, we all own this. But there’s a realization here that we have to face, and it always comes down to, in the end, we have to decide what dollars we’re gonna give. But you have to consider your PASSHE debt that you have, looking at the big picture. Declining enrollment that you have. Lack of control and cost of salary benefits and in pension costs — and some of that, you know, we have responsibility for. You got about $1.8 billion dollars, I understand, on infrastructure costs that you have to do. Spending on advertisement — me, personally, if you go down and you prioritize, that’s the last place I’m going. Best advertising is word-of-mouth, and I know that I have five schools in my areas, as they they go up on that part of state. And I have kids coming up to me all the time, ‘Hey, I’m going to Slippery Rock! Hey, I’m going to Clarion!’ They know. So we don’t need to spend money on that. Vulakovich discussed new building and operational costs of existing buildings. He also suggested centralization for procurement and payroll, labor relations, legal services, construction support and information technology. He concluded with remarks directed at APSCUF. Scavello tasked students with recruitment to eliminate problems at their universities. Minority Chair Sen. Vincent Hughes, whose father helped create the State System and served on the Board of Governors, addressed the alarmist comments throughout the hearing. “For all the students in the room, go on social media,” Hughes directed. “Tweet me right now. Pick up one of these; tweet me right now. The system is not going anywhere in four years. Your education is set. Your education is solid. Your education is going to be there. Tell your students. Tell your friends. Let them know right now. Text them right now. The universe, the State System of Higher Education, PASSHE, is not going anywhere, OK? Because when people make irresponsible statements, OK, ‘It’s gonna, it’s gonna die. It’s gonna fall apart!’ It’s not going to. That’s irresponsible. That is completely irresponsible. It sends the wrong message to you. You are here because you’re leaders in your respective universities, so your job is to communicate it back. The system’s not going anywhere. Does it need to be fixed? Does it need to be repaired? Does work need to be done to help make it right? Of course. But that’s life. That’s with everything, OK? You’ve always got to do some adjusting. Time is changing. Life has changed. You’ve always got to make some adjustments. Hughes then ran down the average costs of attending State System universities compared with state-relateds. Hughes outlined higher-education appropriations increases across the U.S. and in Pennsylvania. Hughes summarized State System funding in Pennsylvania, which is appropriating state dollars at about the same rate as 20 years ago. He then defended West Chester University’s retired swimming coach. He compared the situation with Penn State’s football coach, who makes millions of dollars per year where student expenses are higher, Hughes said. Hughes then praised Walton’s service to Cheyney University. Browne began his comments by lauding the Hughes family’s commitment to the State System. “Your commitment to the future of our Commonwealth, which is what this is about — you know, students are here, that’s what we’re talking about, the future of our Commonwealth — is laudable, and we collectively want to be partners with you in that goal,” Browne said to State System representatives. Browne asked what challenges the State System would face if it did not receive its full appropriations request of $73.1 million more than last year. Leadership is discussing options, Whitney said. She said the system hopes to conclude the process and set State System prices by midsummer. A 3 percent increase would translate roughly to $125 more per semester, she said. Whitney addressed Browne’s question about enrollment declines, to which she referred as shifts — and the effects on the State System’s workforce. Browne underscored the importance of workforce competence in his closing comments. “The most important asset this state has in relation to that is our tremendous portfolio of higher-education institutions here in Pennsylvania,” he said. “You know, states can compete with us in subsidies. They can compete with us in tax burdens and tax policy, but no one can touch our system of higher education. It Is the most diverse and the strongest in the nation. Our relationship with it is what’s going to determine whether our state is going to be competitive in the future or not and whether our current demographic challenges are gonna change. What you’ve heard today from a lot of our members is just concern about the future in relation to 10 years of fiscal stress, and the finances and circumstance of the State System of Higher Education are entwined in that. The highest-growing percentage of our population is in senior citizens, it isn’t in younger people, which is reflective in the student populations of our systems of higher education. “Because of challenges financially, our commitments to our systems of higher education over the last 10 years have not kept up with the growth of costs. In fact, as Sen. Hughes then mentioned, we were at a high-water mark in terms of commitments to the system in 2010. … And while that’s happening, the amount of revenue per student is going up, and the cost per student is going up. It’s all a reflection of fundamentals that we’re concerned about. So we have to really consider as, hopefully, the state moves forward financially in a stronger position, where the Commonwealth is gonna be in relation to higher education going forward.